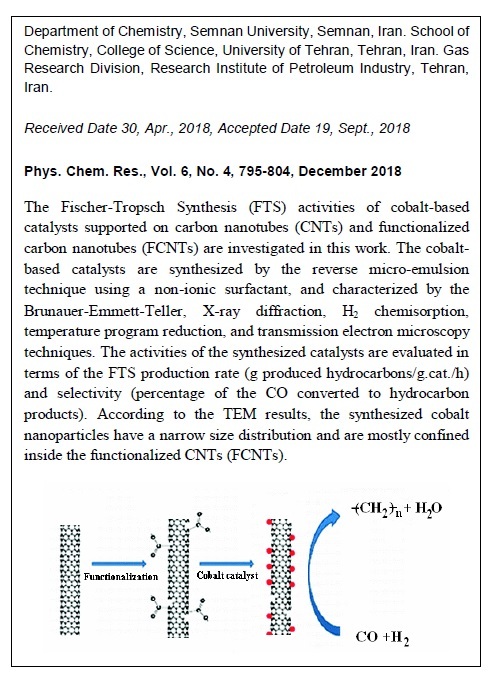 The Fischer–Tropsch Synthesis (FTS) activities of cobalt-based catalysts supported on carbon nanotubes (CNTs) and functionalized carbon nanotubes (FCNTs) are investigated in this work. 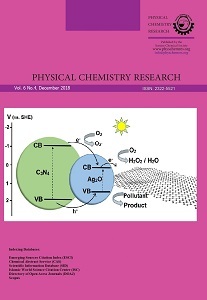 The cobalt-based catalysts are synthesized by the reverse micro-emulsion technique using a non-ionic surfactant, and characterized by the Brunauer-Emmett-Teller, X-ray diffraction, H2 chemisorption, temperature program reduction, and transmission electron microscopy techniques. The activities of the synthesized catalysts are evaluated in terms of the FTS production rate (g produced hydrocarbons /g.cat./h) and selectivity (percentage of the CO converted to hydrocarbon products). According to the TEM results, the synthesized cobalt nanoparticles have a narrow size distribution and are mostly confined inside the functionalized CNTs (FCNTs) . These nanoparticles are highly reducible as evidenced by the reduction peaks of the FCNT catalyst shifting to low temperatures. In comparison to non-functionalized CNT, FCNT increases the FTS rate and CH4 selectivity and decreases the C5+ selectivity as a catalytic support. In addition, the FCNT support preserves the high dispersion and reducibility of cobalt, which can be attributed to the hydrogen spill-over effect of the functional groups present on the CNT surface.